This section contains various art work based on `\pi`, `\phi` and `e` that I created over the years. Some of the numerical art reveals interesting and unexpected observations. For example, the sequence 999999 in π at digit 762 called the Feynman Point. Or that if you calculate π to 13,099,586 digits you will find love. `\pi` day art and `\pi` approximation day art is kept separate. For some time I have been thinking about creating minimalist typographical art based on the digits of `\pi`. The `i`-ness `\pi` project was one of my first forays into this kind of art. For each `i`th digit in `\pi`, `\pi_i`, its `i`-ness is the average of the distance between `\pi_i` and its `n` neighbouring digits. The `i`-ness is a general property based on the neighbours of a digit. When `i` is assigned a fixed value (e.g., `i=4`) then the average distance is calculated relative to 4 instead of `\pi_i`. Thanks to Lance Bailey for suggesting this idea. Consider the starting sequence in `\pi = 31415...`. The 4 neighbours of the 3rd digit `\pi_3=4` are (3, 1, 1, 5). The differences between its neighbours and `\pi_3 = 4` are `-1`, `-3`, `-3` and `1`. So at this position, the average is the `i`-ness and is `-1.5` with a standard deviation of `1.7`. If we calculate the difference relative to a fixed number (e.g. 5), we get the 5-ness of `\pi`. 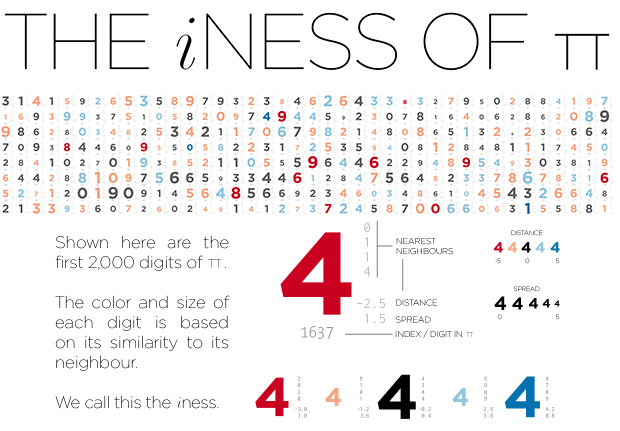 For the position `\pi_3` the 5-ness is the average of the differences between the neighbour digits and 5. These differences are `-2`, `-4`, `-4` and 0. The average value here is `-2.5` with a standard deviation of `1.9`. In the `i`-ness of `\pi` poster shown above, the average is mapped onto a color and the standard deviation onto size. Based on the color you can tell how far away from 4 the neighbours are. Brown 4s have smaller neighbours and blue/green 4s have larger ones, on average. The type face of the main digits is Gotham. Index annotation is set in The Sans Mono Condensed Light and the neighbour and statistics annotations in Inconsolata.